"Relaxing, spacious, beautiful, home from home" - all comments from previous guests. Set in a residential area with lovely mountain views in all directions. There are many fantastic activities on offer in the area. From the moment you walk through the giant front door, the villa is spacious and modern. The lounge features a traditional Austrian wood burning tiled stove, large screen TV and access to the children's games room and sun terrace with relaxing seating area and covered dining area with a gas BBQ should you wish to get al fresco with your cooking. There is a large garden as well. The west side of the property also has a large balcony - perfect for watching the sunset at the end of the day. The spacious living area includes a bar (left for you to stock) & book corner. Although we are surrounded by beautiful mountains we are situated in a sunny and flat valley which makes cycling and walks accessible to all. As well as all the mountains we are practically surrounded by lakes. Out of the 76 lakes in the region we have 4 beautiful lakes within a 5-15 minute drive or longer walk/cycle ride, perfect for a dip on our hot summer days. In addition we are perfectly situated for day trips to other large lakes such as Hallstatt, Wolfgang and Attersee to name but a few. In Winter we are just a short 5 minute drive to our local ski resort the Feuerkogel, and a lovely scenic drive of 40 minutes to Dachstein West or the Krippenstein. Slightly further afield are the resorts of Kasberg and Postalm. All these ski resorts are well setup with snow cannons, great lift systems and, normally, very quiet pistes. Additionally in Winter there are opportunities to go for sled rides drawn by huskies, romantic winter wonderland walks round frozen lakes with snow shoes, ice skating on frozen mountain lakes, cross country skiing and relaxing as the snow falls in the thermal spa waters at Bad Ischl. There is a large private carpark at the front of the house and free WIFI is available during your stay. 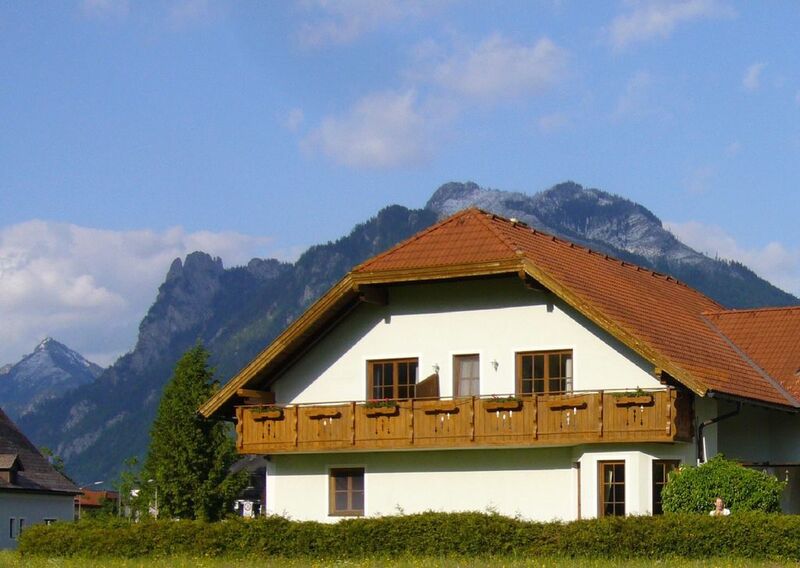 The Villa is 1 hour by car from Salzburg (a great day trip) and just a 15 minute drive from the Imperial Spa town of Bad Ischl with its thermal spa. Hand towels, Bath towels & Tea towels are provided. These are not to be taken to the lakes or spa. Please bring your own beach towels. Helt fantastisk hus, egentlig et gasthause men det var muligt at leje det hele så der er god plads til alle. Huset indeholder alt hvad man kan ønske sig. Cathrine og Robert er fantastiske, hjælpsomme og meget omsorgsfulde værter. Byen er meget hyggelig og fra kabelbanen i byen tager det 5 minutter så er du oppe på toppen af bjerget og kan stå på ski. Vi havde alle en fantastisk jul fuld af hygge, afslapning og oplevelser. Freundliche und hilfsbereite Vermieter, saubere und großzügige Wohnung für 10 Personen. Wir waren rundherum zufrieden und können das Ferienhaus nur weiter empfehlen. Der Rosenhof hat uns sehr gut gefallen. Wir waren als Großfamilie mit 9 Erwachsenen und vielen Kindern da. Jedes Schlafzimmer hat ein eigenes Badezimmer, sodass man sich jederzeit gut zurückziehen konnte. Der Wohnbereich ist geräumig und liebevoll eingerichtet. Die Kinder hatten viel Spaß im Spielzimmer. Es besteht sogar die Möglichkeit drinnen und draußen zu Essen. Alles in allem perfekt für uns. Die Vermieterin ist sehr lieb und stand stets für Informationen zu Verfügung. Eine perfekte Unterkunft für uns. Gerne wieder! Im Innern fanden wir eine geräumige Diele mit großer Gardarobe, große Küche mit allem was man zum Kochen braucht,großes Wohnzimmer mit vielen gemütlichen Sitzgelegenheiten, hier konnte jeder sein Plätzchen für seine Entspannung finden. Die Schlafräume im Obergeschoß waren ausreichend groß und dass jede Familie ihr eigenes Bad und Toilette hatte,war ein rießiger Komfort. Die Vermieterin war überaus freundlich und hilfsbereit. Das Haus war noch schöner und geräumiger als auf den Bildern. Die Besitzer, welche in einem Nebengebäude wohnen, waren sehr nett und zuvorkommend! Wir hatten auch sehr viel Glück mit Schnee (40cm) direkt am Haus. Alles in Allem war es ein Sehr schöner Urlaub in einem wunderbarem Haus. La casa es una maravilla, grande y muy cómoda, fuimos diez adultos y dos niños y la verdad es que han sido vacaciones inolvidables. La ubicación es inmejorable y muy tranquilo, a poca distancia del lago Traunsee, y de los demás en coche.Las habitaciones muy amplias y cómodas con su baño lo cual es un lujo, muy bien equipada en todos los aspectos y la terraza una maravilla para relajarse, los niños han disfrutado mucho del cuarto de juegos. Y la pareja que lo llevan Catherin y Robert son unos anfitriones ectraordinarios haciendo sentirse a uno como en casa ha sido un auténtico placer conocerles y poder disfrutar de esta maravillosa casa, repetiremos sin duda la aconsejo. Hausregeln liegen auf im Haus und werden auf Bedarf vorab zugesandt. Achtung: Keine Veranstaltungen/Feste erlaubt, es ist kein Party Haus, keine Haustiere erlaubt, es ist ein nicht Raucher Domizil. Bitte bringen Sie Ihre eigene Strandtücher (die Badetücher im Haus darf man nicht zum See oder Therme mitnehmen). Check In ist nach 16:00. Wir wohnen nebenan und teilen das Haupttür. Im Haupteingang gibt es den Haupttür der Villa.